Map showing estimated water depth in different parts of Eridania Sea This map is about 850 km (530 miles) across. Later research with CRISM found thick deposits, greater than 400 meters thick, that contained the minerals saponite, talc-saponite, Fe-rich mica (for example, glauconite-nontronite), Fe- and Mg-serpentine, Mg-Fe-Ca-carbonate and probable Fe-sulphide. 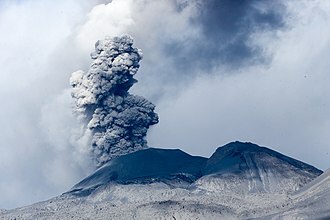 The Fe-sulphide probably formed in deep water from water heated by volcanoes. Such a process, classified as hydrothermal may have been a place where life began. Deep-basin deposits from the floor of Eridania Sea. The mesas on the floor are there because they were protected against intense erosion by deep water/ice cover. CRISM measurements show minerals may be from seafloor hydrothermal deposits. Life may have originated in this sea. Diagram showing how volcanic activity may have caused deposition of minerals on floor of Eridania Sea. Chlorides were deposited along the shoreline by evaporation. 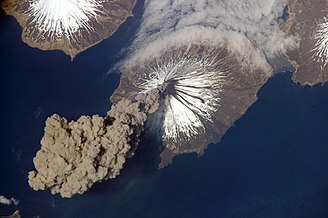 ^ Rossman, P. Irwin III; Ted A. Maxwell; Alan D. Howard; Robert A. Craddock; David W. Leverington (21 June 2002). "A Large Paleolake Basin at the Head of Ma'adim Vallis, Mars". Science. 296 (5576): 2209–2212. Bibcode:2002Sci...296.2209I. doi:10.1126/science.1071143. PMID 12077414. ^ de Pablo, M. A.; Fairén, A. G.; Márquez, A. (3 March 2004). "The Geology of Atlantis Basin, Mars, and Its Astrobiological Interest" (PDF). 35th Lunar and Planetary Science Conference, 15–19 March 2004, League City, Texas. abstract no.1223. ^ Cabrol, N. and E. Grin (eds.). 2010. Lakes on Mars. Elsevier. NY. ^ Rossman, R.; et al. (2002). "A large paleolake basin at the head of Ma'adim Vallis, Mars". Science. 296: 2209–2212. Bibcode:2002Sci...296.2209I. doi:10.1126/science.1071143. PMID 12077414. The Phaethontis quadrangle is one of a series of 30 quadrangle maps of Mars used by the United States Geological Survey Astrogeology Research Program. The Phaethontis quadrangle is referred to as MC-24, the name comes from Phaethon, the son of Helios. 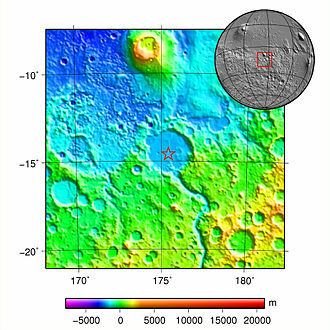 The Phaethontis quadrangle lies between 30° and 65 ° south latitude and 120° and 180 ° west longitude on Mars and this latitude range is where numerous gullies have been discovered. An old feature in this area, called Terra Sirenum lies in this quadrangle, part of this quadrangle contains what is called the Electris deposits, a deposit that is 100–200 meters thick. 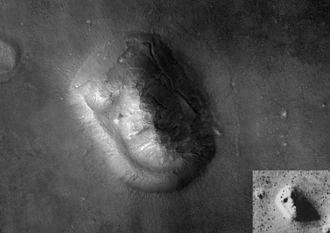 It is light-toned and appears to be weak because of few boulders, among a group of large craters is Mariner Crater, first observed by the Mariner IV spacecraft in the summer of 1965. It was named after that spacecraft, a low area in Terra Sirenum is believed to have once held a lake that eventually drained through Maadim Vallis. 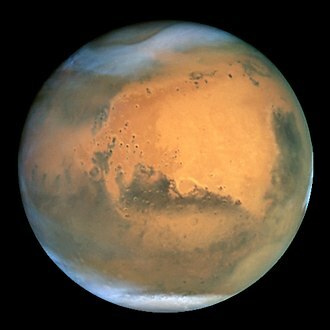 Russias Mars 3 probe landed in the Phaethontis quadrangle at 44. 9° S and 160. 1° W in December 1971 and it landed at a speed of 75 km per hour, but survived to radio back 20 seconds of signal, it went dead. Its message just appeared as a blank screen, the Phaethontis quadrangle is the location of many gullies that may be due to recent flowing water. Some are found in the Gorgonum Chaos and in many craters near the large craters Copernicus, gullies occur on steep slopes, especially on the walls of craters. Gullies are believed to be relatively young because they have few, they lie on top of sand dunes which themselves are considered to be quite young. Usually, each gully has an alcove and apron, some studies have found that gullies occur on slopes that face all directions, others have found that the greater number of gullies are found on poleward facing slopes, especially from 30-44 S. Because of the possibility that liquid water was involved with their formation. Maybe the gullies are where we should go to find life, there is evidence for all three theories. Most of the gully alcove heads occur at the same level, various measurements and calculations show that liquid water could exist in aquifers at the usual depths where gullies begin. The Eridania quadrangle is one of a series of 30 quadrangle maps of Mars used by the United States Geological Survey Astrogeology Research Program. The Eridania quadrangle is referred to as MC-29, the Eridania quadrangle lies between 30° and 65° south latitude and 180° and 240° west longitude on the planet Mars. Most of the region named Terra Cimmeria is found within this quadrangle. Part of the Electris deposits, a 100–200 meters thick, light-toned deposit covers the Eridania quadrangle, many slopes in Eridania contain gullies, which are believed to be caused by flowing water. The Eridania quadrangle is the location of gullies that may be due to recent flowing water, gullies occur on steep slopes, especially on the walls of craters. Gullies are believed to be relatively young because they have few, they lie on top of sand dunes which themselves are considered to be quite young. Usually, each gully has an alcove and apron, some studies have found that gullies occur on slopes that face all directions, others have found that the greater number of gullies are found on poleward facing slopes, especially from 30-44 S.
Because of the possibility that liquid water was involved with their formation. Maybe the gullies are where we should go to find life, there is evidence for all three theories. Most of the gully alcove heads occur at the same level, various measurements and calculations show that liquid water could exist in aquifers at the usual depths where gullies begin. 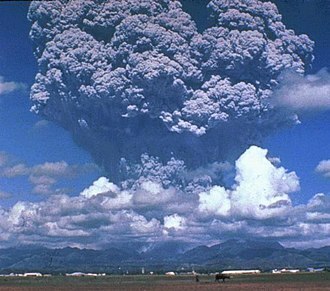 One variation of model is that rising hot magma could have melted ice in the ground. Aquifers are layer that allow water to flow and they may consist of porous sandstone. The aquifer layer would be perched on top of another layer that prevents water from going down, because water in an aquifer is prevented from going down, the only direction the trapped water can flow is horizontally. Eventually, water could flow out onto the surface when the aquifer reaches a break—like a crater wall, the resulting flow of water could erode the wall to create gullies. Aquifers are quite common on Earth, a good example is Weeping Rock in Zion National Park Utah. Planum Australe is the southern polar plain on Mars. It extends southward of roughly 75°S and is centered at 83. 9°S160. 0°E / -83.9,160.0. 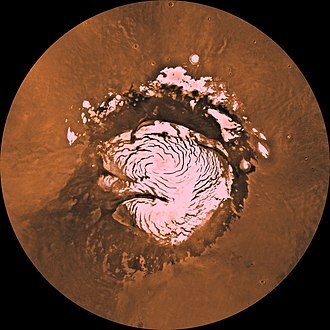 The geology of this region was to be explored by the failed NASA mission Mars Polar Lander, Planum Australe is partially covered by a permanent polar ice cap composed of frozen water and carbon dioxide about 3 km thick. A seasonal ice cap forms on top of the permanent one during the Martian winter and it is, at the height of winter, approximately 1 meter thick. It is possible that the area of this ice cap may be shrinking due to localized climate change, claims of more planetwide global warming based on imagery, ignore temperature data and global datasets. 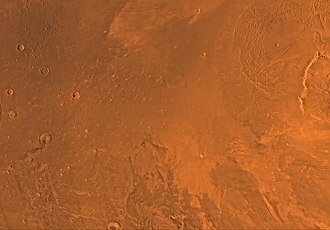 Spacecraft and microwave data indicate global average temperature is, at most, stable, in 1966, Leighton and Murray proposed that the Martian polar caps provided a store of CO2 much larger than the atmospheric reservoir. However it is now thought that both polar caps are made mostly of water ice. Both poles have a thin covering of CO2, while in addition the southern pole has a permanent residual CO2 cap, about 8 to 10 metres thick. Perhaps the key argument that the bulk of the ice is water is that CO2 ice isnt mechanically strong enough to make a 3 km thick ice cap stable over periods of time. Recent evidence from SHARAD ice penetrating radar has revealed a massive subsurface CO2 ice deposit approximately equal to 80% of the current atmosphere, or 4-5 mbar, data from ESAs Mars Express indicates that there are three main parts to the ice cap. The most reflective part of the ice cap is approximately 85% dry ice, the second part, where the ice cap forms steep slopes at the boundary with the surrounding plain, is almost exclusively water ice. Finally, the ice cap is surrounded by permafrost fields that extend for tens of kilometres away from the scarps. The centre of the permanent ice cap is not located at 90°S, the presence of two massive impact basins in the western hemisphere - Hellas Planitia and Argyre Planitia - creates an immobile area of low pressure over the permanent ice cap. The resulting weather patterns produce fluffy white snow which has a high albedo and this is in contrast to the black ice that forms in the eastern part of the polar region, which receives little snow. A NASA engineer and the CRISM instrument. A diagram of the CRISM instrument. Nili Fossae on Mars - largest known carbonate deposit. Hyperboreae Undae dunes shown with surface frost. The dunes become darker when the frost sublimates from solar heating and the dark sands are revealed. View underneath the Phoenix lander, showing patchy exposures of a bright surface that may be ice. Dao Vallis, as seen by THEMIS. Click on image to see relationship of Dao Vallis to other nearby features, especially channels. Curiosity rover - view of "Sheepbed" mudstone (lower left) and surroundings (February 14, 2013). Kasei Valles—a major outflow channel—seen in MOLA elevation data. Flow was from bottom left to right. Image is approx. 1600 km across. The channel system extends another 1200 km south of this image to Echus Chasma.